Verizon is expanding its smartphone roster in a big way today, with the introduction of four new devices: LG Revolution, Xperia Play, HTC Trophy and Motorola Droid X2. The LG Revolution‘s claim to fame is LTE-capability, which makes it the faster device in this bunch as far as data transfer speeds go. Other than that, it’s a mid-to-high range Android smartphone with a 4.3-inch, 800×480 pixel screen, single-core 1 GHz Snapdragon CPU, a 5-megapixel back camera and a 1.3-megapixel front one for video calls and 16 GB of storage memory. 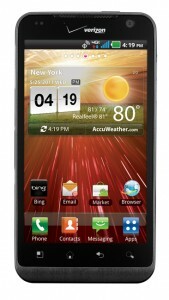 The Droid X2 is a more powerful beast with a dual-core 1 GHz CPU, and 8-megapixel back camera, and a 4.3 inch, 960 x 540 display. The lack of LTE makes it $50 cheaper than the LG revolution, though: it costs $199 with a two-year contract with Verizon. The HTC Trophy is a fairly standard Windows Phone 7 device, with a 3.8-inch, 480×800 pixel display, a 1 GHz Snapdragon CPU, a 5-megapixel back camera, 16 GB of storage memory, all of which makes it the cheapest device in this bunch – it goes for $149 with a two-year contract. Finally, the Sony Ericsson Xperia Play, as the only phone to bear the PlayStation mark, has the distinction of being made for gaming, while otherwise it’s another Android with a 4-inch, 480×854 display, 1 GHz CPU (with an additional Adreno 205 GPU to power all that graphics-intensive games), and an 8 GB pre-installed memory card. It will set you back $199 with a two-year contract. Which one of these devices do you fancy the most? Please, share your opinions in the comments.